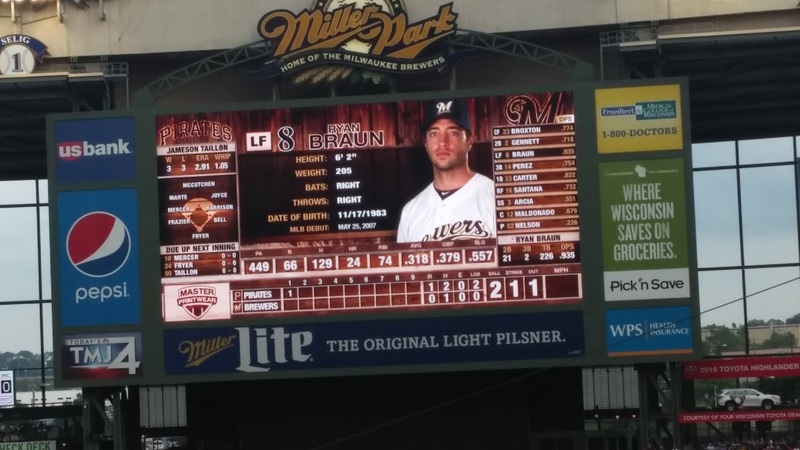 Prior to this past weekend, the only times I've been to Miller Park was when I attended a game with family, and went to Friday's to eat meals with family. Three years ago, I had My 51st Birthday Party at Friday's with family and it was a blast. But at long last, on Saturday August 27, and Sunday August 28, I finally had my first opportunity to cover a couple games at Miller Park, which is now in its' 15th year of operation, replacing the Demolished County Stadium. I also saw the Milwaukee Brewers and Green Bay Packers games at the old venue. The Brewers faced the Pittsburgh Pirates, and in the two games we attended, the end result wasn't a good one for the home team. On Saturday Night, the Pirates defeated the Brewers 9-6 in front of 35,295 fans. Former Tiger Hernan Perez had a big night for the Brewers. He had his first multi-homer game of his career as he had a pair of blasts that went 405 and 412 feet respectively. This series featured other former Tigers. Milwaukee's hitting coach is former Tigers player and coach Darnell Coles, while for Pittsburgh, outfielder Matt Joyce and hurler Neftali Feliz play for the ball club located in Western Pennsylvania. During Saturday's game, we had a chance to see the contest with the roof open, then closed as rain started to fall. When the rain stopped, the roof was opened once again. An interesting fact, the roof open/closed has to be the same for both teams for equality, meaning it can only be changed after an inning. On Sunday, Perez had another hit and made a sensational catch at the right-centerfield wall as you'll see in the photo we've posted. Brewers first baseman Chris Carter made a nice defensive play as you'll see in the photo. The Brewers lost the Sunday contest 3-1 with the paid attendance being 37,583 on Northwestern Mutual Insurance Day at the Ballpark. As I looked at the banners throughout the stadium, The Brewers only World Series Appearance took place in 1982 when they were in the American League. They retired Robin Yount's No.19, Paul Molitor's No.4, Rollie Fingers No.34 and Hank Aaron's No.44. Yount, Molitor and Fingers were headaches for The Tigers when they were in The American League Eastern Division. Other numbers retired include Founding Owner and Former Baseball Commissioner Bud Selig No.1 and Jackie Robinson's No.42 is retired by Major League Baseball. When Selig was Baseball Commissioner, he had two offices. One was in New York while the other was in Milwaukee. Hall of Fame Broadcaster Bob Uecker was honored for 50 years In Baseball in the photo below. There is no question that I miss seeing Detroit and Milwaukee face each other every year. The Detroit Lions, Chicago Bears and Minnesota Vikings are in the NFC North. It would be great if the Tigers had the Chicago White Sox, Minnesota Twins and Brewers in the American League Central. The Tigers own an all-time record of 222-199 against the Brewers. Last season, Milwaukee won two of three versus Detroit. In 2009, the Tigers swept a three-game series versus the Brewers. In 2007, the Tigers won two of three games against Milwaukee, but the big moment in this series was when Detroit Pitcher Justin Verlander tossed a no-hitter on June 12, striking out 12 and throwing a fastball which went 102 mph. Also, The Tigers own one of the top home crowds in Brewers history as 54,630 showed up on July 6, 1979 for a Cushion Night Promotion at County Stadium. In recent years, Detroit signed Prince Fielder, from the Brewers, to a hefty nine-year $214 Million Free Agent contract on January 26, 2012. Fielder would later be dealt to the Texas Rangers for second baseman Ian Kinsler. Fielder retired last month from the Rangers due to a neck injury. During the 2015 off-season, the Brewers (57-76) sent closer Francisco Rodriguez to Detroit in a trade. The acquisition of Rodriguez has Detroit (72-61) in playoff contention. But I do understand why the Brewers are in the National League. They rekindled a rivalry with the Atlanta Braves, formerly the Milwaukee Braves. There is the battle of the Beer Cities when the Brewers face the St. Louis Cardinals. Milwaukee lost to the Cardinals in the 1982 World Series in seven games. Just an hour and 38 minutes/ 90 miles apart on I-94, The Brewers Biggest Rival is the Northside Chicago Cubs. For fans that can't get tickets at Wrigley Field, Miller Park is a good alternative. The same holds true for Chicago Bulls sellouts. Those fans make the trek to the Bradley Center. From an overall standpoint, I'm very impressed with Miller Park. The capacity is 41,900 and the size of the site is 265 acres. While I haven't been to The Selig Experience yet, in addition to an obstructive seat/statue of the icon, which sells for $1 in Section 422 Honoring Hall of Fame Broadcaster Bob Uecker, The Milwaukee Braves Memorial adjacent to Helfaer Field which is for youth baseball, are must sees for a baseball fan. Helfaer Field cost $3.1 Million to build, seats up to 722 fans, and is built on the infield of County Stadium and retains the old foul polls from that field. Along the left-field concourse, there is a marker to designate where the County Stadium home plate was. The City of Milwaukee and The Brewers got this right as it tied old tradition by connecting Helfaer Field to Miller Park. Meanwhile, I look forward to adding more good times in this building. With all the newer ballparks being built, there is no doubt this is a good model to follow. They also did a nice job in the Press Area. But I can only imagine that when the Brewers complete their rebuilding of the team, there is no doubt that this is a good baseball town waiting to erupt. In the two days we were there, it was nice to see the passionate fan base. This is a fan base that embraced outfielder Ryan Braun after he served a suspension due to PED's and gave him a second chance. The only thing missing this weekend was seeing former Tigers Director of Public Relations Tyler Barnes, who is currently the Vice President of Communications for the Brewers. Perhaps, another time. In all my years of dealing with Public Relations People, Brewers Senior Manager of Media Relations Ken Spindler will go down as one of the nicest people I've worked with. Ken treated us so nicely that I felt like I was a member of the local media and there is no question that I'm looking forward to working with him on future projects. He treated us with respect and made us feel at home. We did enjoy an enlightening moment as Candice was at a major height disadvantage in the Brewers photo well. She's only 5-4 and the photo well is over four feet deep as she had to use a ladder to get to her spot. Spindler credentialed us for Sunday and informed her of other places where she can take pictures and as you see above, His cooperation paid off tremendously. On Sunday, Darnell and I spoke before the game. It's hard to believe that Coles and I met 30 years ago in Lakeland, FL, when he was a player with the Tigers, and we remain real good friends. Stay tuned for a future story on Coles.